Casas Cueva or Cave Houses are the most authentic way of doing Rural Tourism . They are homes which have been excavated into the clay hills and with all modern-day comforts. Enjoy the pleasures of spending a few days in our cave houses, unique in the Cazorla, Segura y las Villas Nature Reserve. Those of you who have already spent a few days here explain how they have slept and rested like never before, without any noise, in a very pleasant temperature; those memorable moments around the fireplace together with friends or your partner; or tasting a delicious barbecue on the terrace overlooking the Sierra Nevada. What does our Nature Reserve entail? Who has not heard of it at some time or other? The largest in Spain, with a wide variety of flora and fauna, plenty of rivers, lakes, high mountain peaks, quite isolated and numerous routes for all kinds of hikers. We are also an Adventure Activity company with horseriding routes, quads, 4x4, canoeing, etc. We would be delighted to show you these routes and activities and guarantee a very friendly service. These peculiar and pleasant homes are located in caves, on the outskirts of the village of Hinojares, to the south of the Cazorla Mountains, one of the most peaceful villages in the Nature Reserve and with the greatest diversity of sceneries. - Cueva del Mesto (sleeps 9): has two double rooms and two twin rooms, 2 bathrooms, a hall and a lounge with a fireplace and TV, a kitchen with all the necessary utensils, fridge, microwave, washing machine, as well as a lawned garden with a barbecue and large parking facilities. 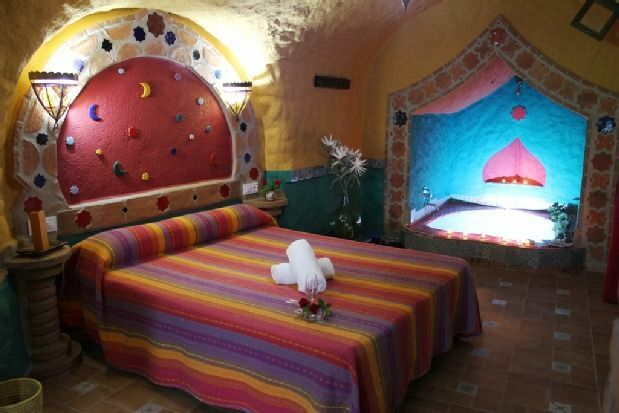 - Cueva de Topete (sleeps 6-8): has two double rooms, one of them with a whirlpool bath, a twin room, a bathroom with a whirlpool bath, a lounge with a fireplace and firewood oven, TV, a kitchen with all the necessary utensils, microwave, fridge, barbecue and large parking facilities. - Cueva de Santi (sleeps 6-8): has two double rooms, a twin room, 2 bathrooms one with a whirlpool bath, a lounge with a fireplace and TV, a kitchen with all the necessary utensils, microwave, fridge, barbecue and large parking facilities. - Cueva del Turrilla (sleeps 6): has a double room and another with three beds (one double bed and two single), a 35 m² lounge with a fireplace, TV, antique radio, a kitchen with all the necessary utensils, microwave, fridge, bathroom, barbecue and large parking facilities. - Cueva de Lola (sleeps 4): has two double rooms, a bathroom and a lounge-kitchen with a fireplace, microwave, fridge, washing machine, TV, sofa bed and an outside barbecue and large parking facilities. - Cueva de María (sleeps 2): has a double room with the Jacuzzi, a lounge with a fireplace and TV, a kitchen with all the necessary utensils, microwave, fridge, washing machine, bathroom, barbecue and large parking facilities. - Fully equipped : all the necessary kitchen utensils, bathroom, whirlpool bath, bed linen, a lounge with a fireplace and TV, shared swimming pool. - The inside temperature practically does not change throughout the year, which makes it cool in summer and warm in winter. - The scenery and the absence of noise will guarantee a lovely rest. - A garden with paths, a table made of an old mill stone, a fountain and a barbecue provide all the necessary extras for a delightful rest and pleasant get-togethers. - Back indoors , its simple and cosy decoration, as well as a very different architecture with white stone walls and ocher coloured vaulted ceilings, gives anyone who sleeps here a sense of being in an atmosphere of peace and relaxation, finding oneself in complete harmony with nature . - Free entrance into the Public Swimming pool, 100 metres away.